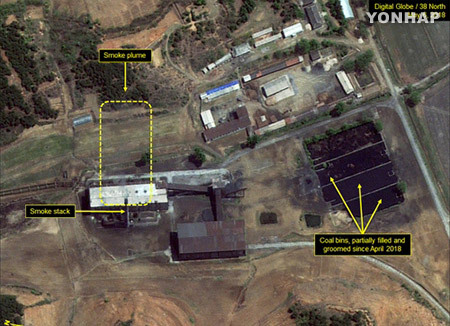 A U.S.-based monitoring group says certain activities have been recently detected at North Korea’s main nuclear facility but it is unclear whether the regime is operating a nuclear reactor. The 38 North Web site revealed on Thursday the result of its analysis of satellite imagery from July 31st of the North's Yongbyon Nuclear Scientific Research Center. The report said there is indication of “ongoing work” on the secondary cooling system for the center's 5 megawatt reactor. However, it noted that only “a low-flow discharge” was seen coming from the pre-existing cooling water outfall pipe and was likely a result of residual heat from earlier reactor operations. The satellite imagery also captured continued dredging of the Kuryong River next to a new pump house associated with the reactor’s secondary cooling system. Next :Koreas Postpone Joint Inspection on Gyeongui Line to Next Mon.